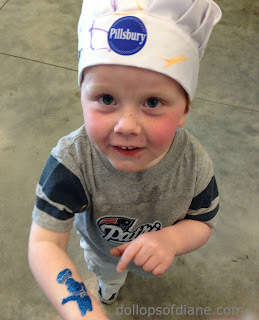 On Friday, the kids and I got to attend a great event put on by Pillsbury at Make Meaning. We got to learn all about ways to jazz up your pizza. I have used their ready to go pizza crust before but never really thought to add ingredients to the crust. Toppings on top? Yes, but not on the crust itself. You can add all kinds of spices, cheeses, garlic, or butter to personalize your crust to your liking. The possibilities are really endless. Of course, I was there with the kids so we stuck with just olive oil and parmesan cheese to flavor the crust and then just cheese on top. However, if you're more adventurous than my kids you can find all kinds of ideas and recipes on the Pillsbury site. Click HERE to find them! Henry enjoying some of our pizza! 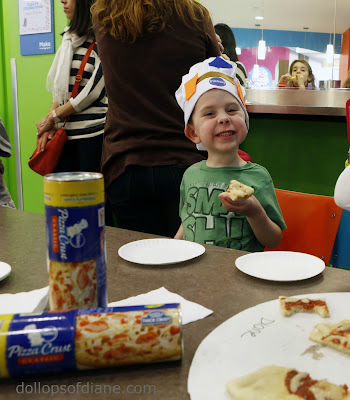 In addition to making pizza, the kids also got to decorate hats and aprons, color pictures, pain ceramic plates/platters, and get glitter tattoos. The kids LOVED it and had so much fun! 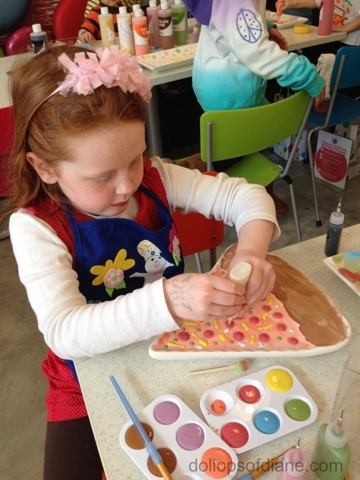 How cute is this pizza plate that Isabelle decorated? Like my Dough Boy tattoo? 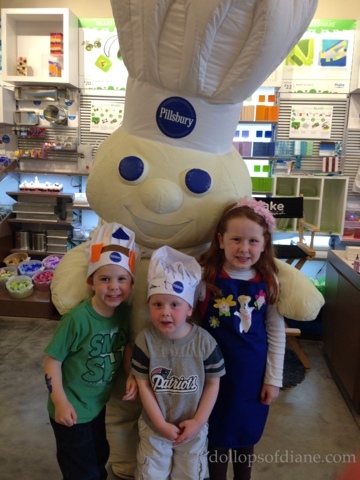 Speaking of the Dough Boy, he was there at the event and the kids all loved him. I couldn't believe that Daniel went up to him since he is usually anti-characters. Then again, who doesn't love the Dough Boy, right? A big thanks to Pillsbury and Make Meaning for including us in this event. The kids are already asking when we can go back!